London: G. G. and J. Robinson, No. 25, Pater-noster Row. [from page 41] The Queen. THE petticoat of white satin, richly embroidered in chenille withgold and silver, in the form of feathers festoonned with gold laurel. Thewhole embroidery has been worked by the princess Elizabeth, who hasdisplayed uncommon taste in the execution of it. The train and body ofblack velvet. The Princess Royal. A crape petticoat, embroidered with goldand white satin, in oval forms, festooned with gold laurel. The body andtrain white and gold. Princess Augusta. A very beautiful petticoat of white crape,most richly embroidered with gold and silver. In the front was a design ofthe Order of the Garter. It is impossible to conceive any thing more elegantthan the work. The colours of the rose and thistle might rival nature; andthe garter and the plume of feathers were likewise done in the mostexquisite workmanship. The drapery was embroidered the same. The bodyand train of green and gold tissue silk. The caps were, for the most part, in the Turban fashion, made of blackand coloured velvet. Several ladies wore turban caps of gold and silvercrape, with very high plumes of feathers, which were universally worn. Several ladies appeared with tippets round their necks, of gold and silver laurels, which had a novel and very pretty effect. The hair was dressed in a loose fashion, but much concealed by the caps. Necklaces and ear-rings of cornelian were chiefly worn; except by those ladies who had diamonds or pearls. There were not so many new dresses yesterday at court, as we have been accustomed to see; several ladies choosing to reserve theirs for the first appearance of the princess of Wales at court. Almost one third of the gentlemen yesterday at court were in regimentals. Elegant oval buttons, beautifully enriched, or various coloured metals, appeared new, and had a pleasing effect. The duke of Bedford's equipage was by far the most magnificent that went to court; and the splendour of it did credit to his grace's princely fortune. This issue contains "A new Pattern for a Gentleman's Handkerchief." There is also an engraving to go with "The Libertine Reclaimed" that is printed on pages 159-160, shown above. In addition, the April issue includes three fashion descriptions (these were not illustrated) on pages 181-2. To suffer with patience, to rise superior to misfortune, and to repay unmerited ill-treatment with benevolence, are virtues which not only promote the happiness of those who can excercise them, but frequently recall the licentious to the paths of their duty. Mr. Fairfax was a man of fashion, vivacity, and dissipation. Endowed by nature with an elegant person, and a vigorous understanding, he had added to these many pleasing and polite accomplishments. But the warmth of his passions, which the largeness of his fortune enabled him to indulge, plunged him into the vortex of licentious pleasure; and he ardently pursued the phantom of sensual gratification, though he still grasped only disappointment and langour. In this course of life he continued for some years, till he found his finances not a little deranged. Debts accumulated, his estate became embarassed; and, as he was no longer able to pursue his pleasures with the same relish, want supplied the place of repentance, and indigence that of reformation. Marriage was, therefore, now the only remedy; a desperate one, indeed, but indispensable. He looked around him among his female acquaintance, and many giddy things stood candidates for the valuable prize. His person, his pleasing manners, and his good sense, which he still possessed, notwithstanding all his irregularities, enabled him to obtain the approbation of a young lady of considerable beauty and discretion, who was heiress to a large estate, which, soon after her marriage with him, came into his possession. As his attachment, however, to any single woman had never yet been everlasting, it was not so now. His lady brought him a beautiful girl; but, in less than two years after he had submitted to put on the hymeneal chain, his taste for dissipation and riot again returned; he plunged deeper into debauchery than he had done even before his marriage. In vain did Mrs. Fairfax with tenderness remonstrate; he treated her with contempt, with insult, with brutality; and connecting himself with a dissolute female, squandered on her his fortune without reserve. 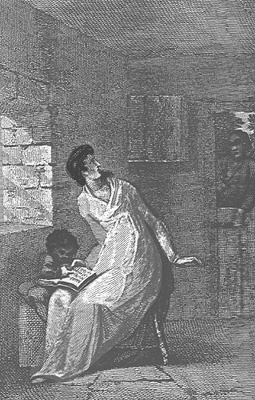 A separation now took place; Mrs. Fairfax retired with her daughter to a little neat house, in a romantic part of Derbyshire, where she lived on a small annuity he allowed her; endeavouring to forget her faithless husband, in her admiration of the beauties of nature, and her attention to the education of her child. Mr. Fairfax, on his part, continued his licentious course. He took his extravagant mistress to every fashionable entertainment, every place of polite resort; but happiness and real enjoyment fled before him, and instead of these he was obliged to accept of noise and nonsense: still however he persisted, for a kind of stupor and intoxication seemed to have benumbed his better faculties. Mrs. Fairfax, meanwhile, by the propriety of her deportment, her good sense, and her accomplishments, won the respect and esteem of all her neighbours. But her story was not known, nor was the ill-usage of her husband, or her own unmerited sufferings, on any occassion the subject of her conversation. the door, with a bloody sword in his hand, who hastily begged assistance for a wounded gentleman in an adjoining field, and that he might be received into the house till a surgeon could be procured to dress his wound. Mrs. Fairfax, after some inquiry, found that the gentleman had fallen in a duel, and that the person who came for assistance had been his antogonist. She immediately repaired to the place with her maid and the gardener. But what was her surpise to find the wounded gentleman was no other than her husband, whom she now, for the first time after an interval of several years, beheld weltering in his blood and nearly insensible! At this shocking sight, a mingled sensation of terror, compassion, and love, took full possession of her heart. But without losing time in fruitless lamentation, or a wild expression of violent feelings, she took care that he should be immediately conveyed to her house. A surgeon was procured, who pronounced the wound extremely dangerous, though not such as absolutely to preclude hope. He was conveyed to a bed where he was carefully attended by her he had so ill treated. Night after night, without once closing her eyes, she waited on him, exerting her utmost efforts to sooth his pains, anxious to supply every want, and anticipate every wish. At length by her tender attention, and the judicious treatment of his surgeon, he was so far recovered, that there seemed no reason to apprehend any fatal consequences. But it is time to inform the reader by what means Mr. Fairfax was brought into this dangerous situation. He had accompanied his mistress on an excursion to Buxton, and at an inn on the road, one of his dissipated companions having in his cups used some expressions relative to that lady, which Mr. Fairfax considered as an insult, a duel was the consequence. His mistress, understanding that his recovery was thought doubtful and that he had been received into the house of his wife, accepted an offer then made her by another gentleman of fashion, to whom she immediately attached herself, leaving her former lover to his fate. "Most amiable and best of women, whom Providence seems to have bestowed on me to be my guardian angel, without whose assistance, and generous, though undeserved affection, my riotous follies had probably whelmed [sic] me in death, receive to our arms the returning and truly repentant prodigal. Amid all my wanderings, I never knew delight to compare with what I now feel; you have indeed taught me the charms of virtue. To you I swear eternal fidelity and love; let the past be no more remembered: my future conduct shall, could it be possible, make you amends." Nor were these mere words, extorted by a transient sense of his own danger and her goodness; such unexampled fidelity and tenderness completely reclaimed him, and he returned to his libertinism no more. THE hair dressed in light curls and ringlets. Turban of light blue crape:bandeau of gold foil; set with diamonds and pearls: the hair turnedup, mixed with the turban, and the ends returned in ringlets. Jacket andpetticoat of sprig muslin; four plaits across the petticoat; the jacket turnedon the back with lace. Short sleeves. Small handkerchief trimmed with lace.Sash of blue satin ribband. Three strings of pearls round the neck. Pearl ear-rings. Blue satin shoes. White gloves. Swan-down muff. I. Morning Dress. The hair combed into light curls; plainchignon; white bouffante round the head. Bonnet of blackvelvet, lined with pink satin: the caul of pink satin, spotted with black; thetop fastened and crossed in several parts with black velvet ribband, fastenedto a button on the top, trimmed with pink ribband, made into a large bowin front and behind. One black ostrich feather in the front. Round gown ofchintz, with a narrow flounce. Full cravat round the neck. Black satin shortcloak, trimmed with broad lace. Isabella bear-skin tipped and muff.Red Morocco slippers. II. Morning Dress. The hair in light curls and ringlets: whitesatin ribband round the head, tied with a bow in the front: bonnet of blackvelvet, lined with yellow satin ribband, forming a large bow in the front,and behind; one small [from page 182] bow of black ribband on the leftside. Petticoat of worked muslin, with a Vandyke scollop at the bottom. Spencer of dark blue cloth, edged with scarlet. Ruff of white laceround the neck. Plain muslin handkerchief. York tan gloves. Purple shoes.Fur muff. [from page 275] A Crape petticoat, spangled with silver, a blue crapedrapery, spangled and drawn up with blue bands, and trimmed with blacklace and diamonds, with a blue and silver train. The Princess of Wales. Crape richly embroidered with silverlaurel, blue and silver belt, a white and silver train with purple embroideredwith silver. The Princess Royal. Crape richly embroidered with green andpurple foil, with a spangled crape drapery festooned with laurel, tied upwith bunches of silver laurel. Princess Augusta. Spangled crape with border of blue, and silver embroidered spangled drapery, with blue and silver bands, and festooned with silver laurel.